Jellyfish will eat any living thing that is small enough to fit into their mouths (and most pet jellyfish are typically fed brine shrimp). Jellyfish (also called jellies or sea jellies) are aquatic invertebrates (they don’t have backbones) from the phylum Cnidaria. They have gelatinous, bell-shaped bodies and are known for their stinging tentacles. Interestingly, they do not have bones, blood, brains, hearts, or even gills (they breath by diffusion which is where they absorb oxygen through their thin skin). They are made up primarily of water and protein (jellyfish are over 95% water). Jellyfish are found in every ocean in the world and come in a wide range of sizes (from microscopic to larger than humans). They also vary in how long they live (from a couple of days to a couple of years). Contrary to popular belief, many jellyfish are not even “true” jellyfish. The word jellyfish is an umbrella term that is often used for both “true” jellyfish and animals that are very similar in appearance (such as sea combs). “True” jellyfish are scyphozoans (from the class Scyphozoa), and other jellyfish are hydrozoans (from the class Hydrozoa). For this article, when referring to jellyfish, we mean “true” jellyfish (other jellyfish may occasionally be referenced for comparison, but they will always be called other jellyfish for the sake of clarity). 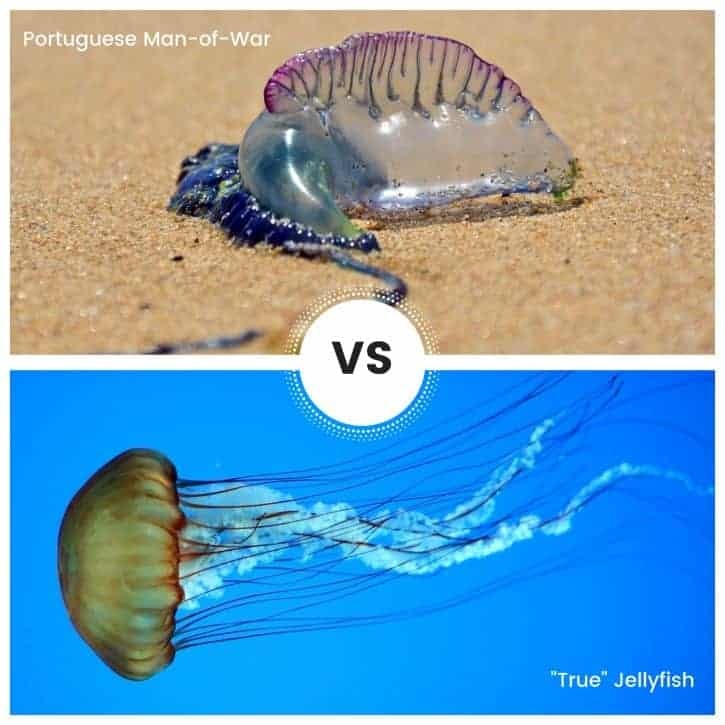 Fun fact: the Portuguese man-of-war which is infamously known for its incredibly painful stings (sometimes deadly), is not a “true” jellyfish (it is a hydrozoan or other jellyfish). While all “true” jellyfish sting (other jellyfish may or may not sting), the severity of their sting depends upon the size and species of jellyfish (as well as the type of venom they produce). Certain species’ venom does not even produce a reaction in humans! Because of this, as well as the fact that jellyfish are incredibly beautiful and hypnotic to watch, jellyfish are gaining popularity as pets for aquatic animal lovers. 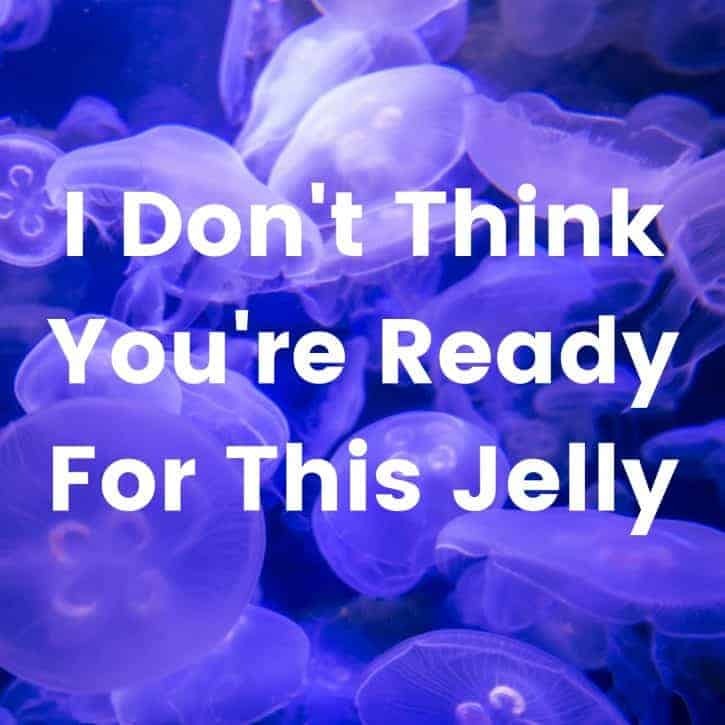 The most common jellyfish (in the wild and as a pet) is the moon jellyfish (Aurelia Aurita) which is also known as the common jellyfish or the saucer jelly. Jellyfish go through several different life cycles and what you normally think of as a jellyfish (translucent gelatinous body with tentacles) is just one stage (the medusa stage) of a jellyfish’s life cycle. The medusa stage is the adult reproductive stage, and therefore an adult jellyfish is called a medusa (plural medusae). During the other stages, you would hardly even recognize it as a jellyfish! Fun Fact: the medusa stage is named after the mythological Greek monster Medusa (because of its similar appearance to Medusa’s head of snakes). Jellyfish will eat any living thing that is small enough to fit into their mouths. They are carnivorous (meat-eating), and they are also opportunistic predators (they eat whatever they happen to come across as opposed to ambushing or actively pursuing their prey). Jellyfish also often practice cannibalism (where they eat other jellyfish). In the wild, jellyfish typically eat a variety of zooplankton (tiny sea animals). Depending on the size and species of jellyfish, they can eat anything from eggs or larvae to crustaceans or even small fish! A common jellyfish prey is brine shrimp, and it is the staple food for most pet jellyfish. Brine shrimp can be purchased at aquatic pet stores as either eggs (which you hatch yourself) or as adults. How Do Jellyfish Get Their Food? As mentioned before jellyfish are opportunistic predators. One of the reasons for this is that jellyfish are not very good swimmers! While they can propel themselves along, they mainly float (some species even float upside down) or drift along currents. While they are floating, they wait for prey to become trapped or stung by their tentacles. All “true” jellyfish (and some but not all other jellyfish) have tentacles that have thousands of stinging cells which are called cnidocytes. These cnidocytes are full of venom-packed stingers called nematocysts. Whenever prey comes into contact with the tentacles, the nematocysts are shot out, and they inject venom into their victim. Fun Fact: the nematocysts that jellyfish have can penetrate human skin faster than the time it takes you to blink. 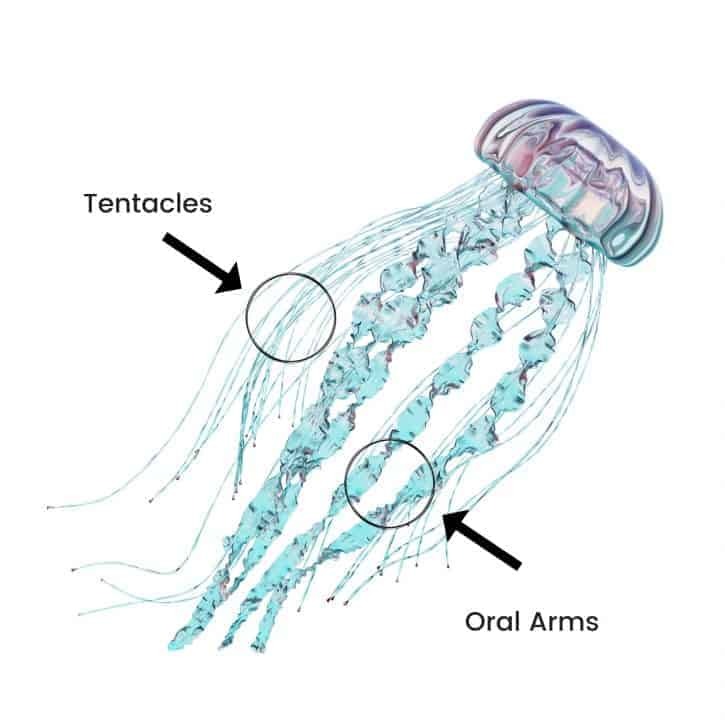 After jellyfish stun, paralyze or even kill their prey (depending on their level of venom and the size of their prey), they then pull their food into their “mouth” (which is just a hole at the bottom center of their body that is also where they eject waste). The food is then moved into the gastrovascular cavity (which serves as a stomach) where it is digested. Since most jellyfish are translucent, you can see this happen! What Do Baby Jellyfish (Ephyrae) Eat? Baby jellyfish (called ephyrae) have a slightly different diet than adult jellyfish. First, let’s look at what constitutes as a baby jellyfish. As mentioned earlier, jellyfish have several different stages in their lives. 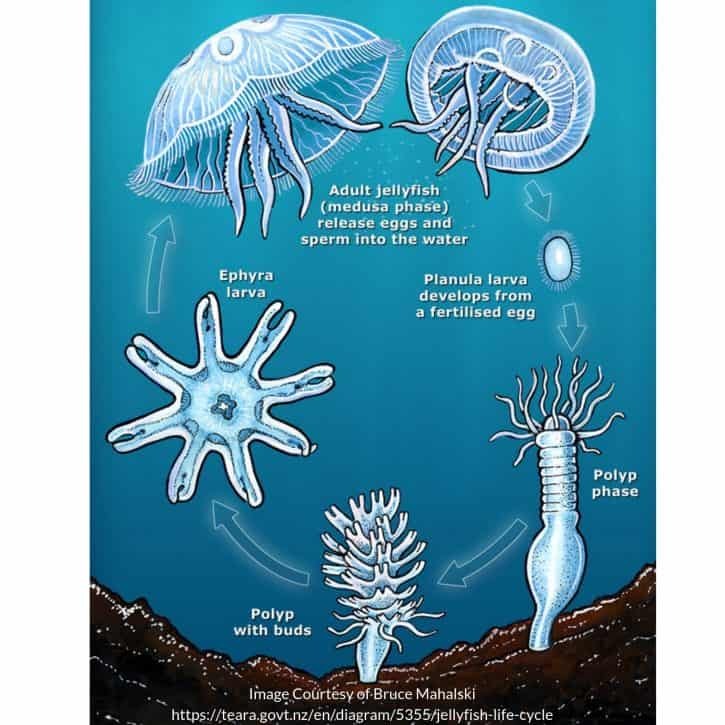 A very brief overview of their complicated life cycle is: a fertilized egg hatches and becomes a planula larva, this larva transforms into a polyp, the top of this polyp will bud off and become a baby jellyfish (an ephyra), and this ephyra eventually turns into an adult jellyfish (a medusa). Fun Fact: due to their complex life cycle jellyfish reproduce both sexually and asexually! Ephyrae eat small food particles, small eggs or larvae, or even other ephyrae. Like adults, they are opportunistic predators, but they are much more restricted by their size (most are only a millimeter or two in size). However, some people use the term baby jellyfish when they are referring to a younger adult jellyfish (that is in its medusa stage but is smaller than older medusae). This is because what most people recognize as a jellyfish is the medusa stage, and they do not realize that there is a stage before that. Ephyrae do not have the distinctive round bell-shaped body yet. This means that when you purchase a baby jellyfish if it looks like a typical jellyfish in shape, it is, in fact, an adult. These “baby” jellyfish are typically fed brine shrimp eggs or freshly hatched brine shrimp. What Do Adult Jellyfish Eat? Adult jellyfish (called medusae) will eat any living thing that is small enough to fit into their mouths. In the wild, they typically eat zooplankton, and as pets, they typically eat brine shrimp. Note: while jellyfish are not scavengers (who feed on dead animals), pet jellyfish can and will eat frozen brine shrimp (or other frozen pre-made jellyfish food). 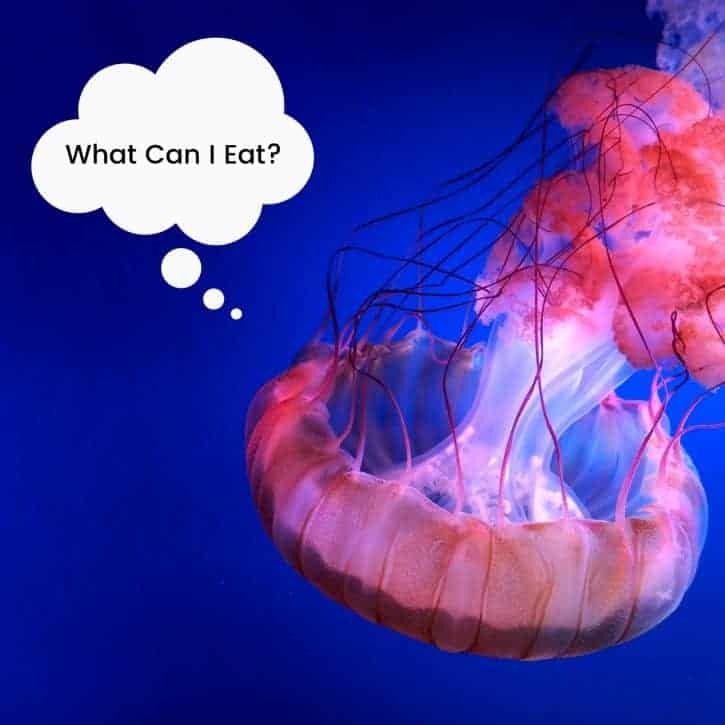 However, it is important to remember that frozen food will often settle to the bottom of a tank if not immediately eaten (which can affect water quality and is where jellyfish cannot reach). This is because of water currents. Remember how jellyfish are not strong swimmers? But live brine shrimp can swim around (which is not only cleaner but also has the added benefit of leaving a snack for your jellyfish later!). How Often Should I Feed My Jellyfish? Jellyfish need to be fed at least once a day (the frequency can also depend on the size, species, and how many jellyfish you own). It is a good idea to use a pipette or a small baster to place food in your jellyfish tank (this helps give you better control over how much food you are feeding your jellyfish). Remember that live food is easier for jellyfish to reach (and therefore eat) and helps with water quality. Since most people keep jellyfish in groups (why would you want just one of these amazing creatures! ), live food also helps ensure that all your jellyfish get fed (instead of just the ones near the top getting the food, and then it settles, leaving less for others). Fun Fact: a group of jellyfish is called a smack. Since brine shrimp is such a common food for jellyfish, many people find it easier to hatch their own than to buy them live. This enables your jellyfish to have live food, but you can purchase it more easily in bulk since it is frozen. You can hatch freeze-dried brine shrimp eggs in salt water for 24 hours, and then feed it to your jellyfish. 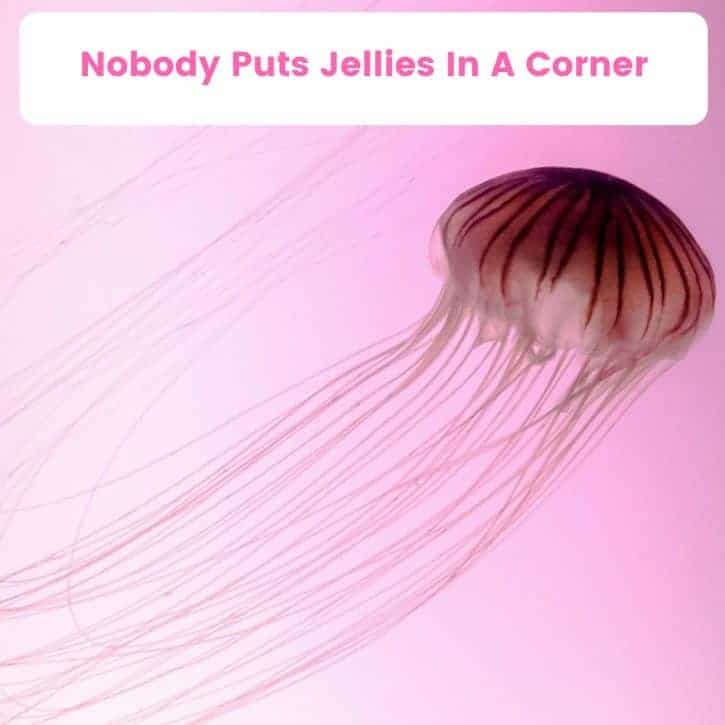 If you are ever stung by jellyfish tentacles (they can sting you whether the tentacles are attached or not and even if the jellyfish is dead), do not pee on the area (this is an urban legend and may make the wound worse). Instead, use vinegar or salt water to help cleanse the wound. Also, never remove tentacles by hand! You should use tweezers instead. They are carnivorous (meat-eating), and they are also opportunistic predators (they eat whatever they happen to come across as opposed to ambushing or actively pursuing their prey). Jellyfish also often practice cannibalism (where they eat other jellyfish). Baby jellyfish (called ephyrae) have a slightly different diet than adult jellyfish because they are more limited by their size. They eat small food particles, small eggs or larvae, or even other ephyrae. In the wild, adult jellyfish (called medusae) typically eat zooplankton (tiny sea animals), and as pets, they typically eat brine shrimp. Jellyfish are not picky eaters and are only limited by what they can fit into their mouths. While jellyfish are not scavengers (who feed on dead animals), they can and will eat frozen brine shrimp (or other frozen pre-made jellyfish food). However, live food is easier for jellyfish to reach (and therefore eat) and helps with water quality. Jellyfish need to be fed at least once a day. Never pee on a jellyfish wound, (instead, use vinegar or salt water to cleanse it). You should also never use your hands to remove tentacles (you can use tweezers instead).